1989-90 Fleer Basketball Boxes Have Skyrocketed In Price. Oh yeah!! Good old 1989-90 Fleer basketball cards. Seems like only yesterday that I was a 20-year-old kid when this product hit the marker back in 1989. It was in that year of ’89 that the 1986-87 Fleer basketball card set took off in price. In late 1988 you could have gotten a Michael Jordan Fleer rookie card for about $5. If only I would have known then what I know now I would be a rich man. With the sudden success of that 86 set, collectors, including myself, were really excited when the 89-90 product came out. I can still remember going to a baseball card shop in my hometown of Sacramento, California and buying tons of packs for 50 cents each. The hot rookies we were trying to find in those packs back then were players like Kevin Johnson, Reggie Lewis, Hersey Hawkins and Mitch Richmond to name a few. Of course, when we would pull a 1989-90 Fleer Michael Jordan 3rd year card out of the pack, we were really excited. Over the years ,after this product came out, collectors started to realize that the 89-90 Fleer set would never live up to its 86-87 premiere issue because Fleer let the presses run and more product was produced. And of course, we know that the 86 set carries the Jordan rookie which obviously helps. As the years continued to roll by, box prices of this product seemed to settle at around $45 to $50. Until recently! I hadn’t even looked at prices on eBay for years until recently when a collector posted a thread on the Blowoutcards forum. He mentioned that the prices of 1989-90 Fleer boxes have caught fire and have skyrocketed in price. So I went over to eBay and checked it out for myself and I could not believe it! An opened box sold yesterday for $235!! See the screenshot below. Click Here to see these 89-90 boxes on eBay. 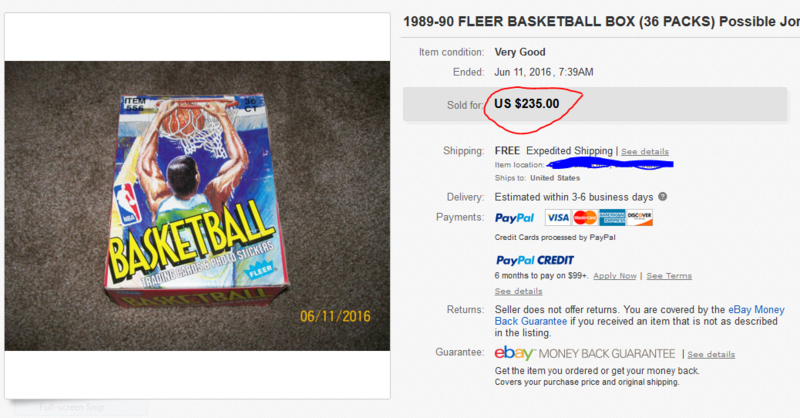 Unopened 1989-90 Fleer basketball boxes have skyrocketed in price. What has driven this product up in my opinion is graded cards. Back in 1989 this Fleer set was noted for having some of the worse cut cards ever produced. It seemed like every card you pulled out of a pack was off centered and cut wrong. This has driven collectors to look for the most centered cards that they can find and send them into PSA or BGS to get graded. Some of the high grades of 89-90 Fleer have brought in some hefty prices on eBay. A graded PSA GEM MINT 10 1989-90 Fleer Michael Jordan just sold for $600. The stickers that were inserted into this set have sold for even more as a Michael Jordan PSA GEM MINT 10 just sold for $3,449.99 in late May 2016. Click here to see these Jordan stickers on eBay. I have a ton of these cards and they have been sitting in boxes for years and years. I guess it is time for me start sorting through them again. Should be fun as it will return me to my youth back in 1989. 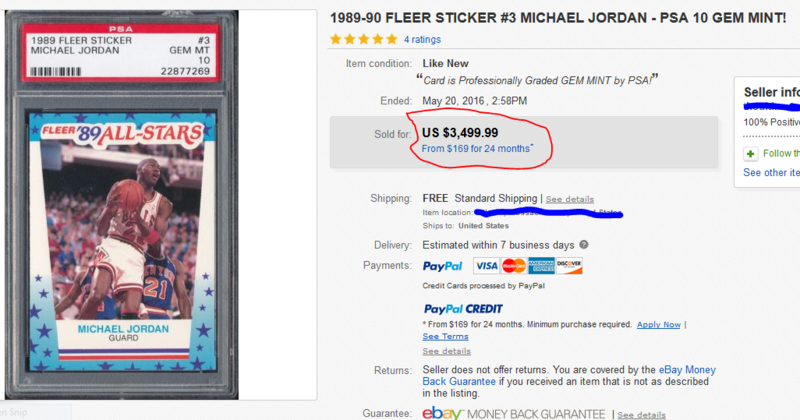 A Michael Jordan 1989-90 Fleer All-Star Sticker graded GEM MINT 10 sells for $3500 on eBay. 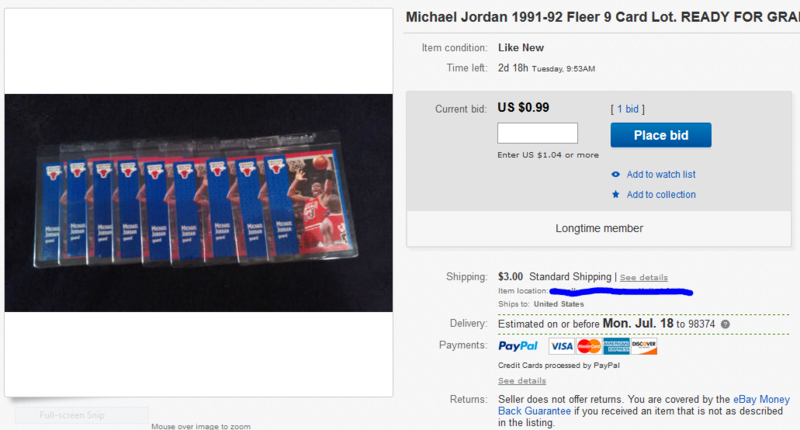 1991-92 Fleer Michael Jordan Cards Selling Well On eBay Too. 6/21/16-The 1991-92 Fleer Michael Jordan card has caught fire on eBay. This card is not selling for a ton of money by itself, but if it is sold in lots it is bringing in some surprisingly high prices. I just sold some of these Jordan cards myself. 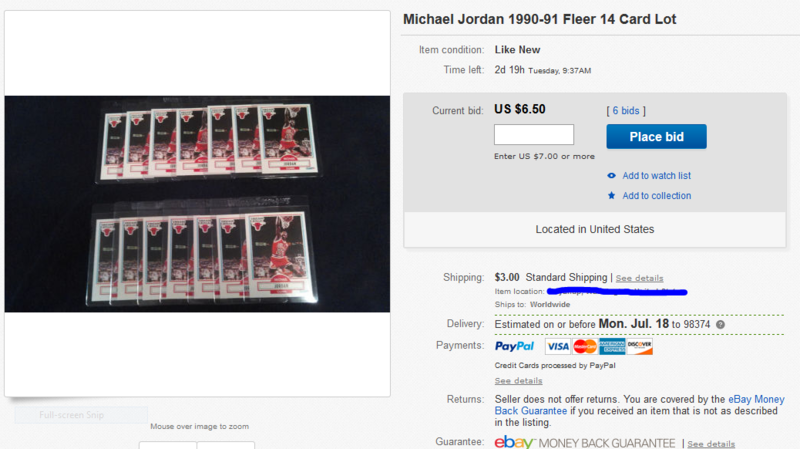 I placed a 7-day auction a little over a week ago for a LOT of 12 1991-92 Fleer Michael Jordan cards. I started the auction at $0.99. It stayed that way for a few days. I then started to get a few bids. It went up to $2.00 by the third day. Then the weekend hit and the bid was up to $18.89. Okay, so I am figuring since there is only one day left of the auction, it might end at around the $30 range. As Monday approached and there were just minutes left of the auction, I was just itching to see what these cards would end up at in price. Finally, at 10 AM the auction ended. I went to my eBay page and was astonished when I saw that the auction had a final sale price of $96!! I was in shock. It seems like basketball card collectors are really zoning in on pretty much all of Michael Jordan’s early Fleer cards. Not just the coveted 86-87 rookie, but even his 6th year Fleer card like the 91-92 issue. The 91-92 Fleer Jordan card really has a nice color appeal to it. The red and blue colors really stand out. The action shot of Michael is spectacular as well as it shows him gobbling up a rebound. I pulled all 12 of these cards from packs back in the 1991-92 basketball season. They have been in card savers and sitting in a box for nearly 25 years. Below is the actual photo that I took for the auction. 7-9-16-Here is another auction that I have up on eBay right now. It is a Michael Jordan 1990-91 Fleer 14 card lot. As of right now, there are 6 bids and it is at $6.50. All of these Jordan cards are in great condition with sharp corners. If you would like to see the auction, please click here. Below is a screenshot of the auction. Click on image to enlarge. 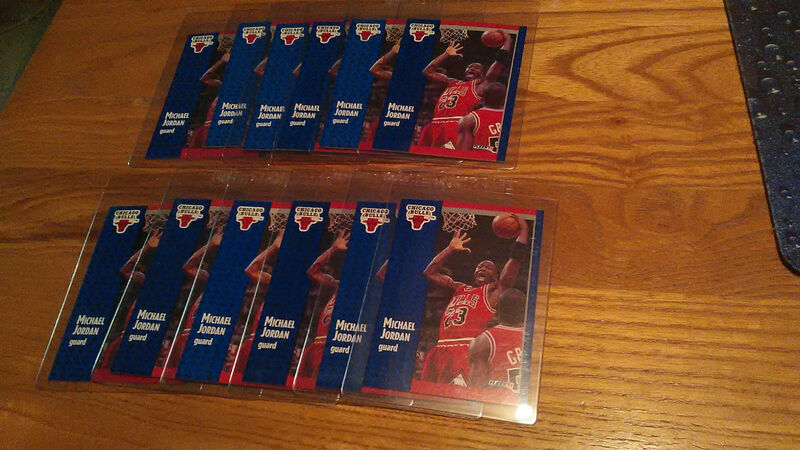 This other eBay auction that I have up now is an 8 card lot of Michael Jordan 1991-92 Fleer Pro-Vision cards. These cards have become popular with collectors as they are buying them and sending them in to be graded. I started this auction at $0.99 and it now has 3 bids and is currently at $2.85. The listing closes on Tuesday, July 12, 2016. If you would like to have a look at this auction, please click here. Screen shot below of this auction. Click on image to enlarge. Finally, my last auction that will also end on Tuesday. It is a 9 card lot of Michael Jordan 1991-92 Fleer cards. I started this listing at $0.99 as well. It has one bid and stands at $0.99 with 2 days left. Click on the image below to enlarge it and have a closer look.